Our "driveway" into the ranch requires you to go down a bumpy dirt road with pot holes large enough to eat compact cars for breakfast. You must open three gates and cross a cattle guard. For those who don't know what a cattle guard is, I want you to imagine a little guard shack set up beside the road where a livestock inspector checks the papers of all bovine visitors and stamps their passports. No . . . it's not that! Gotcha goin' there though didn't I? I make this joke because I thought everyone knew what a cattle guard was until my city-raised sergeant threw up question marks and other members of our crew had a little fun at his expense. Fortunately he has a good sense of humor, and now will never forget what a cattle guard is. A cattle guard is a series of heavy bars set over a shallow "ditch," arranged in such a manner that a vehicle can roll right over it, but a cow or horse (although I sure wouldn't trust a horse) will not want to walk over it because they fear falling through the bars. The whole thing is one big contraption that is just set into the roadway at a fence gap so you don't have to get out and open gates; you can just drive right over it. A determined horse (Montoya!) should never be trusted around such a contraption as it could result in a broken leg, but cattle seem to respect it quite well. I generally like the cattle guard crossing because "I" am the resident gate opener and it relieves me of the burden of opening and closing a gate. Our cattle guard is also in a really pretty stretch of hardwoods. 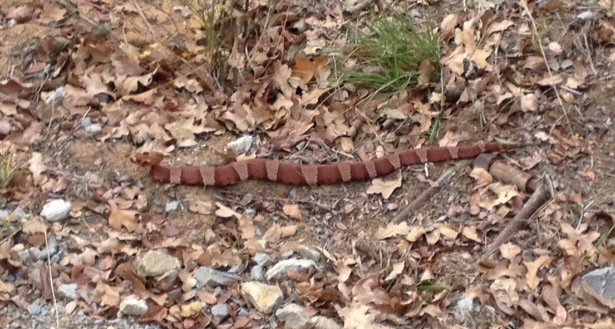 Now this phrase often goes hand in hand with another word - copperheads. "Really pretty stretch of hardwoods" = "Copperheads"
Forgive the quality of picture, but the snake was alive, and the picture was taken with my cell phone while leaning across Other Half, who was still sitting in the driver's seat of the pickup. 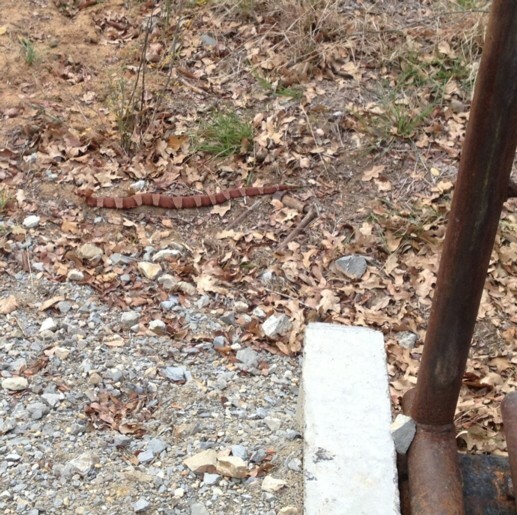 Other Half spotted this copperhead as we were driving across the cattle guard. He stopped the truck to kill it show me. The snake knew something was up because he stopped and raised his little snakey head to examine the large white truck that loomed over him. I actually felt sorry for the snake. Then again, I thought about that emergency trip to the vet when Dillon gets bitten by a snake and it hardened my heart. Other Half is not burdened by my soft-hearted "Live & Let Live" attitude and immediately got a metal t-post out of the bed of the truck and proceeded to assault and batter the poor snake. Now even though I knew it had to be done, I still felt bad . . . until . . . I felt bad until I talked to the neighbor who walks down that road regularly. He reported that he had been bitten twice that weekend. Fortunately he was wearing snake leggings. Okie dokie then . . . Goodbye Snake. 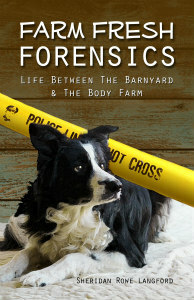 Why, you ask, did Other Half beat him to death when it goes without saying that we had multiple firearms in the truck? Other Half is a considerate hunter and he spotted the snake shortly before dusk when he knew hunters were setting up. He didn't want to fire off shots and thus risk alarming deer in the area. Me? Screw the hunters, I'd have shot the damned snake. I know what cattle guards are, have driven over them, but have never heard of snake leggings. So went to Google it on the computer and one of the listings was to Victoria's Secret.com. Somehow I feel that the snake leggings they have would not keep a person safe from snake bites! Thankfully these guys stand out in the right place, but put them in a pile of leaves and they disappear. A lady in the lumber store near the ranch was telling me about her 83 year old mother who was raking leaves, (at 83) and she picked up her pile and was bitten in the hand by a copperhead. She was in intensive care for 6 days! Crap! Do you remember Tony Hillerman's story of being told by a Native American (don't remember which tribe) that "the snakes are our relatives". One day Hillerman went by his place and saw lots of dead snakes hanging on a fence. And then when he questioned the man the answer was "too dam many relatives".